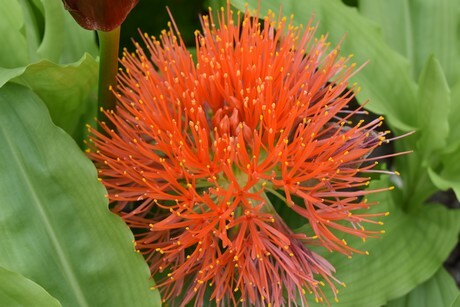 Back in 2018, a remarkable niche product - scadoxus - was looking for a grower. That is, breeder Könst Alstroemeria saw opportunities for the potted plant production of this flower. This opportunity is still there, but in terms of cut flower production they lift things to the next level themselves. Grower René Koning, breeder Könst and product specialist Tjerk Vening joined forces to start a new company, Kings Art Flowers, through which they're looking to give the product a bigger stage. First, let's look back for a second. In 2004, René Koning took over the scadoxus from a breeder in Bleiswijk, a small town in the Netherlands. At the time, production took place at an acreage of about 0.5 hectare, and René continued cultivation in his greenhouse in Holland. In addition, zantedeschia, viola and snapdragons were grown. In 2016, René started a closer collaboration with breeder Könst. Growing scadoxus is not easy, but there's more to it. 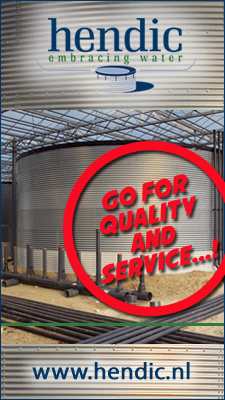 "It's an exclusive product, I'm the only grower, and to promote it properly takes a lot of time. Time I don't have." This partnership turned out well, and it was decided to take things to the next level. The new company, Kings Art Flowers, has three shareholders: René Koning, Hans Könst (owner Könst Alstroemeria) and Tjerk Vening. Tjerk is employed by Könst, however one or two days a week are granted to him to further expand Kings Art Flowers. The stems are sold through the auction clocks in Aalsmeer, Naaldwijk and Rijnsburg, after which the buyers distribute the product across Europe. 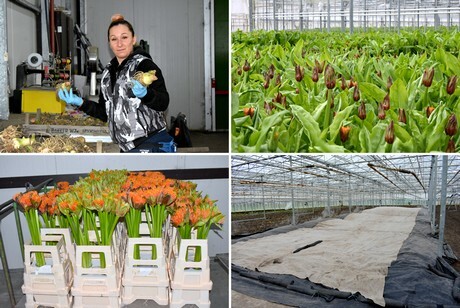 Over the last year, 10,000 bulbs have also been sent to Israel to be propagated there, and part of the bulbs are produced in Kenya and transported to the Netherlands. Partly the bulbs are imported by a potted plant grower, another part is assigned to expand the cut flower cultivation. "Numbers are limited", Tjerk says, "but because we're the only ones, we control the market and dictate prices ourselves. So far this year, trade's good. We need to keep it up and be sure we don't shoot ourselves in the foot by flooding the market." 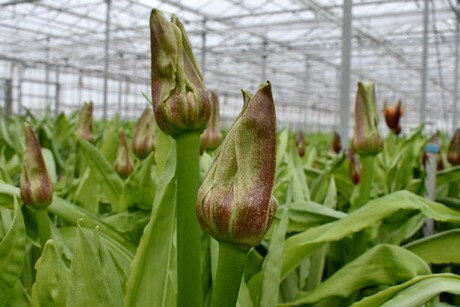 One of the plans is to test the potential of the scadoxus in the North American market. "But that's easier said than done. The stem is pretty heavy, too heavy to be flown from here. A possibility would be to have part of the cultivation in Colombia, for example, but for now this is just an idea." No matter how things will develop, the gentlemen are confident that through this new cooperation the product will be put on the map more. "We don't just grow flowers, we produce bulbs as well. So if for some reason the flower sales slow down, we still have the bulb export. There's always competition, but this isn't the type of product that newcomers can easily and suddenly start to grow in large numbers. 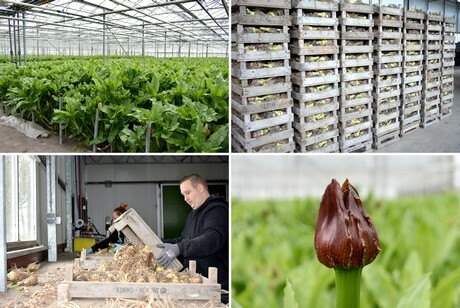 With our motivation and knowledge of the market and cultivation, we're very confident to enlarge the scadoxus' market share."